The Ableware Deluxe Flexible Sock and Stocking Aid, manufactured by Maddak, is the easiest way to put on socks or stockings without the need to bend which can be uncomfortable or even downright painful. Ideal for anyone recovering from hip or knee injuries. Including 29 Inch (74 cm) long straps with loop handles eliminates the need to bend and are easily to manipulate and the loops allow a firm grip. The three-finger design allows the durable molded plastic insert to flex and bend with the contours of your foot. The terry cloth outer layer holds the sock firmly in place while the nylon reduces friction and allows the sock or stocking to slide easily onto the foot with less effort. If you also need assistance putting on shoes you may also want to try a Metal Shoe Horn or a Dressing Stick for assistance putting on other garments such as pants or jackets. 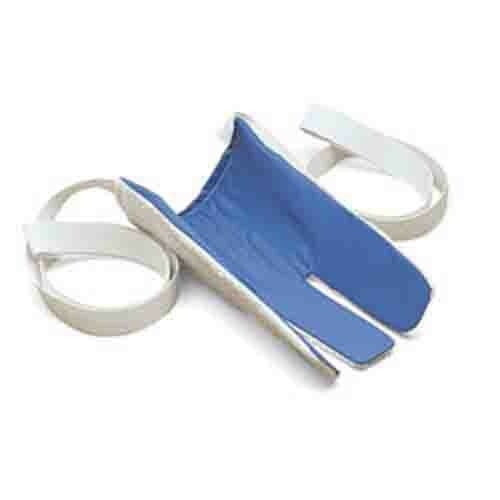 Reduces the need to bend when putting on socks or stockings. Strong and durable molded plastic insert won't crack under strain and will last for years. I havent had a hip replacement but I need one. Trying to make it to a good financial place to have it. One leg bends fine. But the one that needs the surgery wont bend and putting on socks and stockings had become virtually IMPOSSIBLE. First of all I ordered this and got it THE NEXT DAY! Tried it with socks this morning and OMG,OMG,OMG! It works like a charm. Whoever invented this deserves every dime that he/she makes from it. No more pain, agony, and time wasted on getting dressed. No more going bare legged either. Thanks a bunch!